Vegan campaigners have written an open letter to farmers asking them to 'be merciful and open the barn doors' after millions of farm animals drowned in floodwaters caused by Hurricane Florence. The Carolinas are still dealing with the effects of rising floodwaters from the hurricane - a category 4 storm - that made landfall in North Carolina nearly two weeks ago. Around 50 people are believed to have died as a result of Florence, but the majority of victims are farmed animals - left to die, locked in inescapable buildings by farmers who fled to save themselves. Official statistics released by the North Carolina Department of Agriculture and Consumer Services on September 18 say the death toll has reached 5,500 pigs, and 3.4 million chickens and turkeys - and is expected to rise. "These animals should have been evacuated long before Florence made landfall, but meat producers could still have given them a fighting chance if they’d simply let them out,” said Ingrid Newkirk, President of vegan charity PETA. "PETA is calling for the barn doors to be opened in the event that the animals inside will certainly perish and for everyone to take personal responsibility for these pigs' plight by keeping animals off their plates." "Nine months ago, as wildfires ravaged Southern California, stable doors were thrown open for hundreds of horses in San Diego County in order to give them a chance to escape the flames," says the open letter. "That lesson was apparently lost on meat producers who left millions of animals in warehouses to die horrifically by drowning in floodwaters brought by Hurricane Florence. We can only imagine the terror that these individuals must have felt as they looked at each other and realized that there was no way out. 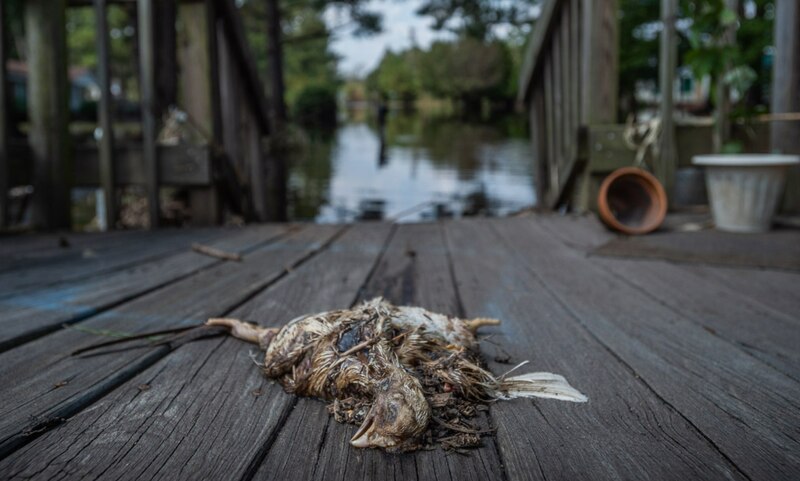 "Florence's catastrophic flooding has killed more than 5,500 pigs and 3.4 million chickens and turkeys so far in North Carolina alone, and those numbers are expected to increase as the flooding continues. The lives of hundreds of millions more animals are at stake, so PETA is calling on farmers to be merciful and open the barn doors to give these animals at least a fighting chance while there's still time." A video captured by Guerin - and sent to Plant Based News - shows pigs swimming through floodwaters of the Hurricane. "We farm animals on such a scale that when disaster comes, evacuating them isn't even an option. They're left behind. Disposable," McArthur wrote about the disaster, afterseeing the scale of animal deaths.